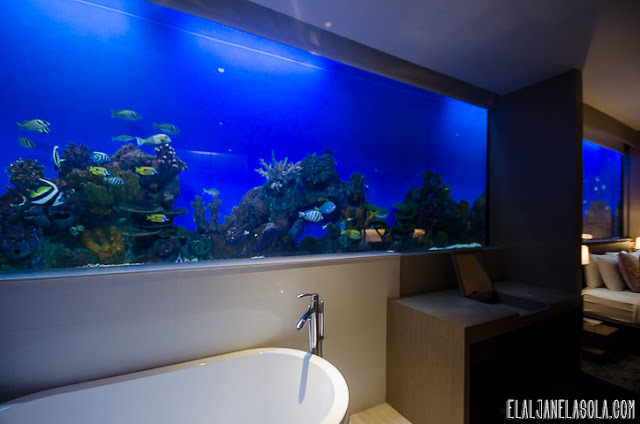 Once upon a time, I envisioned a night where a large aquarium of the underwater marine life surrounds me while I sleep. One weekend, my desire was granted. Perched on a reclamation area of the Manila Bay, the hallways, grand loungers and reception area resembles a cruise ship. 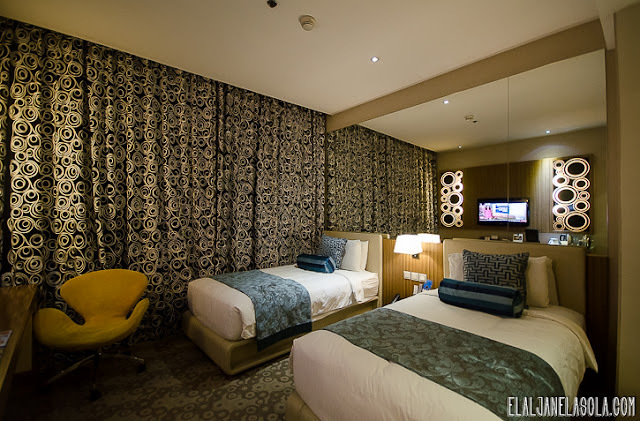 It felt like experiencing a luxurious cruise while at Hotel H2O Manila. Hotel H2O is the first and only marine-themed urban resort hotel in the Philippines. The hotel is part of the Manila Ocean Park and has been designated as the official residence for guests and patrons of Manila Ocean Park. The hotel was designed by GSN + P Architecture Studio and noted to have ensured that the architecture blends harmoniously with the natural environment, combining comfort and elegance with traditional Philippine design and colors. It comprised two floors connected by a long aquarium wall, the only one of its kind in the Philippines. 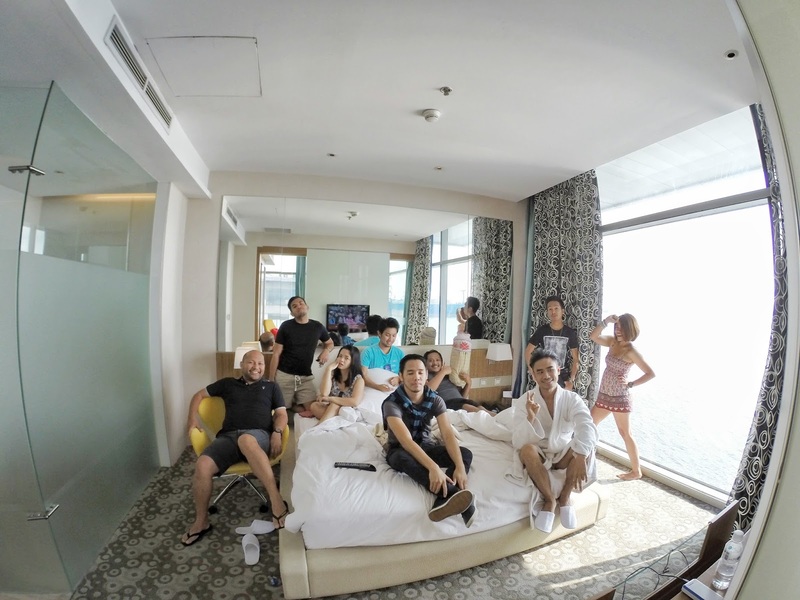 On yet another rare occasion where our group was complete, we checked-in at Hotel H2O Manila for the weekend. And as expected for a weekend, a number of spectators on queue for the Manila Ocean Park greeted us in chaos. Major roads were closed too, so we have to walk for miles to reach the hotel. But the reward of a luxurious stay awaits and serves as consolation for us. A glass of cold iced tea was given as a welcome drink. As soon as check-in process was completed, we individually settled on our assigned rooms. Hotel H20 offers a broad range of accommodation, with 128 rooms and 19 suites spread across 11 room categories, from standard to executive suite. Our weekend was quite unique this time as we get to experience varied types of rooms of unique interior design concepts. While we were individually assigned at different room types, we converge at the different rooms for minutes to experience a “transient stay”. I was assigned to the signature room of the hotel – the Aqua Room. The long aquarium serves as my side wall and like all other rooms, it is equipped with a 37-inch or 40-inch flat screen LCD television and high speed internet, including IDD telephone and complimentary welcome amenities. The ensuite bathroom is covered by glass walls and adorned by modern fixtures. 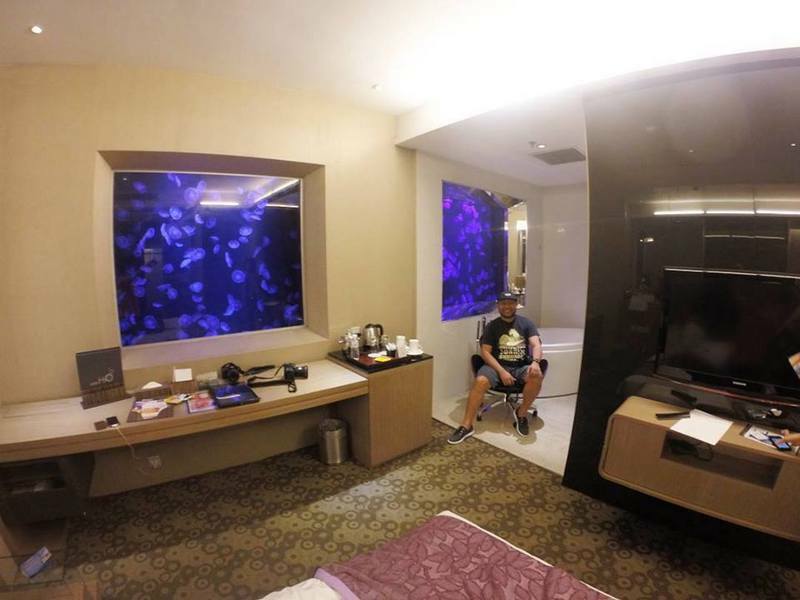 Among the rooms assigned to the group were the Park View, Bay View, Club Bay, Executive Suite and the new offering – Club Jellies Room. The Club Jellies Room has an interesting concept where you literally bathe alongside the jellyfish through its bath tub positioned as part of the room’s layout. It is so far my favorite room in terms of interior design and architectural layout. (click to check other room types and rates) It is perfect for couples with a romantic vibe. A view of the Manila Bay with the rising and setting of the sun has the perfect vantage at Executive Suite, Club Bay and the Bay View. We converged at the Deluxe Suite for the remaining hours of our stay – just watching television and frolicking. 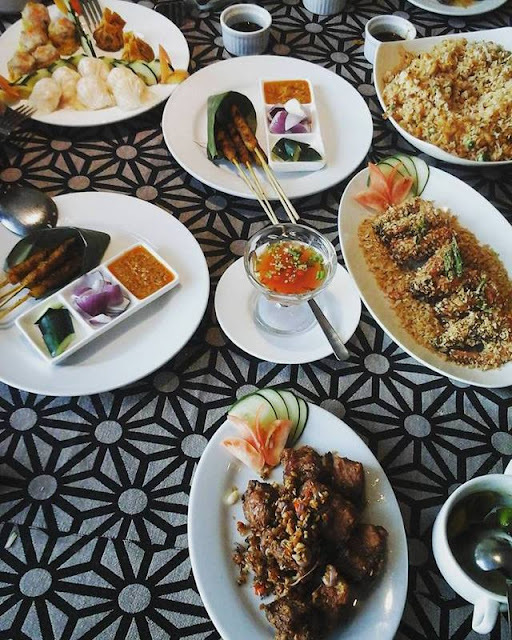 Hotel H2O’s main food and beverage outlet is the Makan Makan Asian Food Village where guests are invited to savor the best of Southeast Asian cuisine. 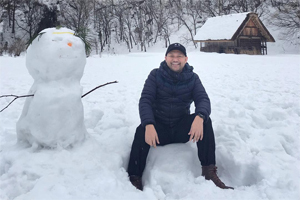 The restaurant boasts as more than a restaurant as it is a veritable pan-Asian village where culinary delights of Singapore, Malaysia, Indonesia, Thailand, China, Japan and the Philippines abound. We had all our meals served at the said restaurant on the duration of our stay. Lunch and dinner were served with Asian favorites – roti prata, Hainanese chicken rice, mee goring, satay, laksa, dumplings and a lot more. The stay comes with a complimentary breakfast with an all-Filipino favorite breakfast choices offered. Accessible from our rooms, we took the opportunity to avail of the spa treatment before checking-out at the hotel. The “negative-ion” treatment makes the spa the most sought-after in the wellness field. Heated ceramic-tile beds and deoxidizers in the therapy rooms emit high doses of healthy negative ions that cleanse the air and rejuvenate the body. The overall effect is holistic wellness for the tired body and even the weary soul. Apart from the massage, thirty minutes was dedicated to the hot bed where we lie on a hot temperature room of heated ceramic-tile beds. My perspiration was endless and we were able to withstand the 30-minute session mostly conversing. I was able to sleep for minutes while the massage session was ongoing. It truly feels rejuvenating. 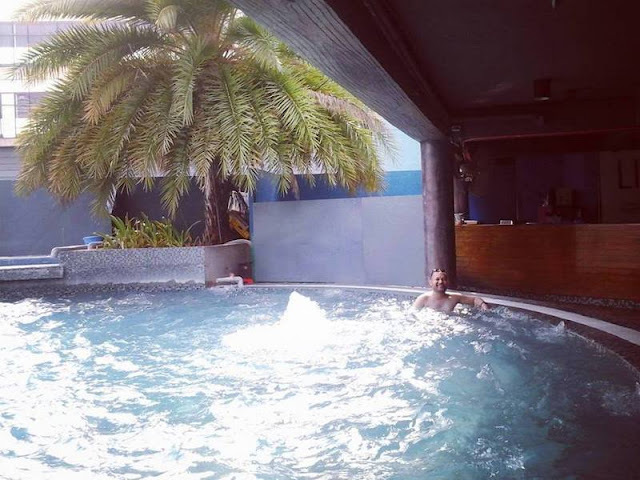 Despite the fully-booked diners adjacent to the pool bar and the number of guests lined-up for one of the shows at the Manila Ocean Park, we cared less and dipped into the pool bar of the Ocean Park. There is a complimentary access for guests of the hotel to the Liquid Pool Bar. My curiosity on how it feels to sleep on a marine-themed resort was answered by Hotel H2O which I am truly grateful. The weekend of fun surrounded by the Manila Bay is another unique experience shared with good friends which you too can enjoy.